The top is in thick ebonite and the brass blocks are lozenge-shaped and undercut. Provided with resistance coils of thick wire for preventing heating when using strong currents. Twin semi-cylindrical contact surfaces are connected by insertion of a plug; this shorts the resistance coil on the bobbin. The 37 plugs are interchangeable and have ebonite handles. A resistance box is a two-terminal variable resistance so designed that any desired known non-inductive resistance may be introduced into the circuit of which it is a part. In the dial-type box several dials are arranged in decades, so that internal switches select the desired resistance. 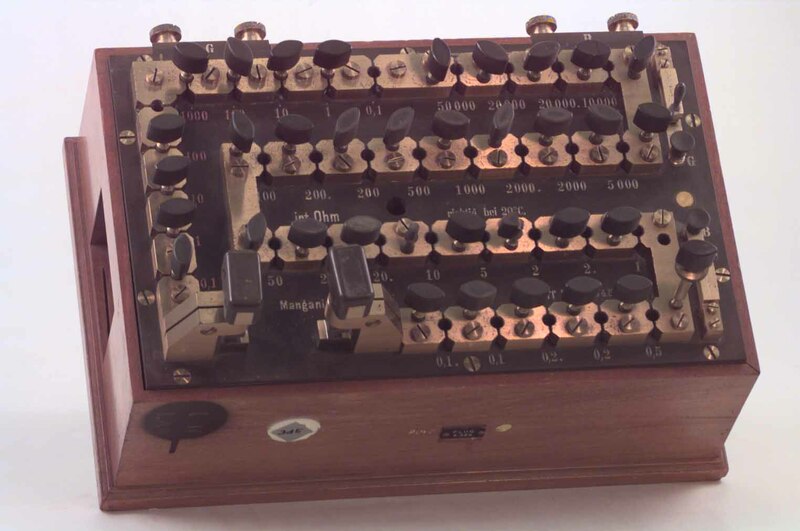 For example, one dial may select any number of thousands of ohms from one to nine. The next, any number of hundreds of ohms from one to nine; the next, any number of tens of ohms, and the fourth, any number of ohms from one to nine. Thus by manipulating all four dials, any value from 1 to 9999 ohms may be set to the nearest ohm. In the plug-type box, such as this made by Otto Wolff, resistance is inserted by removing a plug, which, when in place, short-circuits the resistance. The plugs must, therefore, be kept clean, and when removed from the box, placed on a clean sheet of paper. They are inserted with a clockwise motion, with only slight pressure. When a slight resistance to turning is felt, a good contact has been obtained. 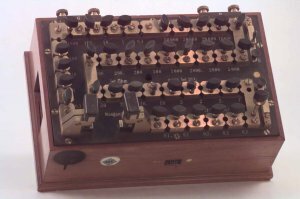 In fact this device is configured as a Wheatstone bridge, with terminals and key switches for a battery (B) and galvanometer (G). An unknown resistance can be clamped between the heavy clamp connectors provided with silver contacts and the bridge balanced with an equal resistance of unshorted coils between 0.1 and 50 000 W.
The coils are of manganin resistance wire, the resistivity of which does not change appreciably with small changes of temperature. The accuracy of such a resistance standard may be taken as about 0.25%. Physics Laboratory Manual, Wall & Levine, Second edition, Prentice-Hall 1962.